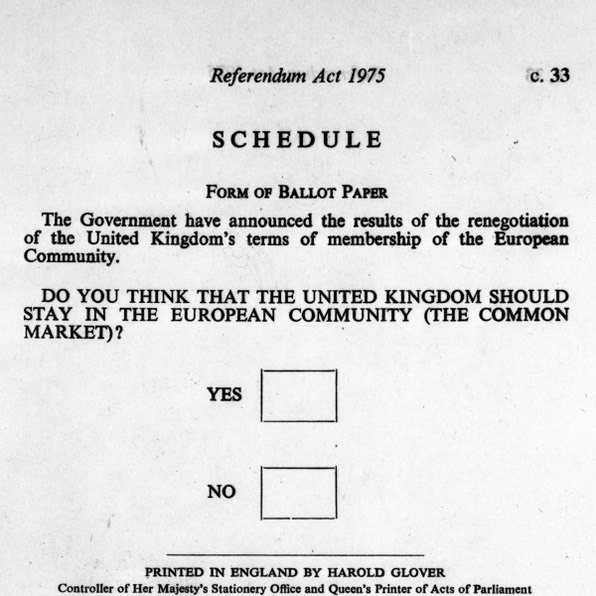 We had a referendum in Britain in 1975 (5th June) to decide whether or not to join the Common Market. Source  provides the detail of the shenanigans to make this event possible. This to the right was what was on the ballot paper, where the bit in brackets was added to reflect what at the time we actually called the club. At the time I thought it entirely wrong to mark one’s preferred choice with an X rather than a tick. The lower image was the 2016 question. You wonder why we needed an Act of Parliament to decide the wording of the question. Or, indeed a wait of any length while this was decided. The result was a 65% turnout with a 67% vote for Yes. Only the Scottish far Isles (Shetland, Orkney) voted No. In the event that you haven’t studied this or don’t remember. We joined the European Communities, the EC, and European Economic Community, EEC, in 1973 ² ( 01Jan1973) and it was the Maastricht Treaty of 1992 ¹ that changed these into the European Union, the EU. So the joining was under Heath (Con) and the referendum confirming this was under Wilson (Lab). It is significant that the referendum act was not legally binding—we were being asked to express an opinion so as to guide Parliament in its behaviour. At the time I thought this wise, even clever. Partly because we’d never had a referendum before I was less aware than I am now just how divided both parties were. We had had a taste of what the EU would mean ands we were voting to Remain/Leave, though such terms were no in our vocabulary at the time. During the lengthy Thatcher ³ years, 1979-90, she continued to argue that the Union should be limited to ensuring free trade and effective competition . As regards Europe, she was a significant component ⁴ of the argument that resulted in the UK rebate (Do read  to understand this). Bear in mind that the Commonwealth changed its nature in 1975 too, thanks to an Australian crisis ; that may well be a change of perception rather than law, but in politics, the perception is what matters, often. The next referendum in Britain was in 2011 , known as the Alternative Vote referendum 20110505. 68% No on a 42% turnout. I notice that the dissenting regions correlate with the previous referendum, in that NI and the north of Scotland tend to disagree with the English majority. My opinion at the time was that I’d looked at other voting systems while at university and that AV was the one of worst of the possible options. The big advantage of the FPTP system is that it is sensitive to relatively small changes in large scale opinion. The big disadvantage is that this serves a two-party system, so whatever smaller parties exist have to have a huge vote to gain seats at all. AV is described  as "disturbingly unpredictable" and "unacceptably unfair”. Personally I might support AV plus⁵ in line with the Jenkins Commission 1998 or STV⁶ as the SNP does. I am distressed at the poor explanations and the poor grasp of how the electorate would behave. There are quite enough examples to generate really good explanations. Until the idea is taken seriously though, there is little point in further exploration. The third national referendum was what we currently think of as the 2016 Brexit vote. Again, mark Yes with an X. Leave won 51.88% on a 72.2& turnout. . 20160623. As with the others, there needed to be an Act of Parliament in advance of the referendum vote, Again, the result was legally non-binding, but the presiding government had promised to act in accord with the result. I continue to think that this was a grave error and that a narrow result should have been discussed widely in advance as giving an ‘uncertain’ result. That would then, I had always hoped, give serious leverage in Europe for reform of Europe, particularly to stem the ‘ever closer union’ bit, at least as applied to the UK. I am sure we’re not the only ones wanting to say ‘enough, already’. Instead, we’ve turned that into a different meaning of enough, shooting ourselves and leaving Europe worse off too.Those who vilify David Cameron have not read of the internal wrangling of the Tory party. The long-standing Eurosceptic wing of that party caused the promise of a referendum and a renegotiation of our position within Europe. Europe proved uninterested in reform—see —and we went to the fateful referendum. Reading these, I see them as what we think we want right now. No wonder, then, that Cameron thought the referendum would go the way he expected. He hadn’t recognised the groundswell of antipathy for all sorts of regulation, austerity, the eurosceptic demands (and lies) and the ranting of the rabid press. Whether we ever have positive outcomes from the levels of lying we were treated to, I doubt. I also doubt that we will have a second referendum. I further doubt that much good will come of this decision. Collection of decisions. There have been many local referendums since 1913 . Currently the Local Government Act [LGA] of 2003 gives the power for any principal local authority to consult in this way and these polls do not have to follow the rules for the larger scale affairs so they can be, to my mind, eminently practical. For example, I remember being asked about a unitary authority in Cornwall (decision no). Similarly  says there have been Fifty-three referendums have taken place in local authorities to establish whether there is support for directly elected mayors. Sixteen were successful and a mayoralty was established; in thirty-seven local authorities an elected mayor was rejected by voters. An additional six referendums have been held on removing the post of elected mayor, with three mayoralties being retained, and three disestablished. I missed the Fylde (more or less where I now live) successful referendum on moving to a committee system for local government. At a very local level a parish can poll its constituency under the LGA 1972. I continue to think that, in the 21st century, we have the ability to poll often on a variety of topics. I do not think that YouGov succeeds for several reasons: there is no attempt to discern whether respondents consider themselves informed and there is no attempt to encourage respondents to become informed before being polled. This could be easily fixed by declaring in advance that <subject> is imminent, that questions might be framed as <list> (allowing for suggestions toward improvement) and that result will be shared on <date>, with back-up questions fo when a result is confused (like Brexit). Using this as something like a large focus group would be good for testing ideas out. This is a largely self-selecting audience, but then the electorate is not dissimilar. Yet again, I ask you to look at what happens when the majority does not vote. We might be very much better off if we changed an attitude there — imagine the reaction if a further 30% turned out but voted None of the Above. This is the occurrence of the null vote (you didn’t vote out of apathy) and the zero vote ( you didn’t vote because no-one standing earned your vote). These are different. See also essay180. A recent conversation, if that is still the right word for interaction using facebook, resulted in someone telling me that spending a few minutes with the average voter was quite enough time to persuade any political type that referendums are a really bad idea. Mrs Thatcher, I remember, was against referendums. Source  has the quote I was hunting for: in march 1975 she described a referendum as “a device of dictators and demagogues” ⁷. Thatcher was quoting Clement Attlee who noticed that Hitler, Mussolini and Napoleon III used referendum to legitimise decisions they had made. See  for detail. Context to Mrs T’s turn of phrase is appropriate. Harold Wilson’s government saw an opportunity to end Labour infighting over Europe. Margaret Thatcher, newly installed as leader of the Conservatives after the defenestration of Edward Heath, put the counter case. In those days, she was a staunch believer in parliamentary sovereignty. . See here and here. 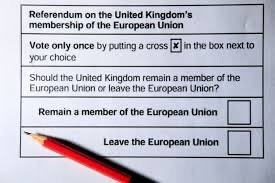 Referendums are flawed because, for some weird unexplained reason possibly buried within the PPERA, they are required to be reduced to a single binary question. Quite aside from that shrinkage of complex to binary, if the objective is to inform that sovereign body, Parliament, then this reduction is inherently unhelpful. Ergo, many conclude that parliament is trying to waive its sovereignty - which was the effect of Brexit. So we have the stupid situation where we employ these 650 experts and their multitude of advisors to take these complicated decisions for us and then decide to hand the decision over to the largely uninformed electorate, while making no serious attempt to inform said electorate from their positions of far greater understanding. Of course the result is unpredicatble, of course it is surprisingly random. They really should know better. What does the electorate learn? Perhaps that these paid experts (paid to be expert, employed for exactly that purpose) are —surprise, surprise—actually unfit for purpose. that does not mean that the electorate, now it has been shown to have power, has any reason to be sensible in exploiting that result. Among the matters that bothered me, following from what I saw as stupidity in the AV referendum (some clever bugger made sure the question would elicit the answer that kept FPTP), so Remain and Leave have pejorative overtones: remain, to play safe, to do nothing when so many of us wanted Europe to wake up and reform in ways conforming to pretty vague ideas and leave implies some sense of giving up, with change and risk-taking. See more of , please, link to more from the same author, particularly this, which, by explaining to marketers how to persuade, allows you to see how we might be manipulated. On this very topic, I found an excerpt form a Margaret Thatcher speech  Damn good read, say I.
I was a little concerned that in the closing parts of his speech [Edward Short] the Lord President said that the British people must have the final say. I cannot quote his exact words, but I think that that was the expression he used. That is inconsistent with his earlier remark that the referendum did not derogate from parliamentary sovereignty. If it does not derogate from parliamentary sovereignty, it is Parliament which has the final say. He said that his pledge was that the British people should have the final say. That shows our constitutional difficulty in discussing this subject and in taking decisions before we have thought about them properly and considered all the consequences. So the errors made by our collective politicians were not only allowing a referendum to occur (explained already) but the subsequent promise to abide by the result committed too many to acting in line with that result, however finely decided. In so doing they surrendered the sovereignty of Parliament. whether, by doing it once they have done so in perpetuity, we have yet to discover, I’ve been saying for quite some time that the vote to enact Article 50 was the crucial moment that historians will point to; the arguments made by Mrs T in source  confirm this opinion. I am happy to hear arguments for other conclusions. I have added a paragraph or two further down the page explaining what a consultative referendum is and how to spot it. This was definitely consultative when enacted. Referendums is logically preferable as a plural form meaning 'ballots on one issue' (as a Latin gerund,referendum has no plural). The Latin plural gerundive 'referenda', meaning 'things to be referred', necessarily connotes a plurality of issues". So referendums is the correct English use for a multiplicity of single issue ballots, while referenda must refer to a plurality of issues. But then when a complex issue is being reduced to a binary choice, even that single-issue ballot is representing the plurality. Maybe Brexit was itself a referenda? https://www.conversion-uplift.co.uk/brexit-referendum-and-democracy/#ixzz5X1dZAPZL The FT requests to be handled differently; maybe a paywall consequence? 1 There’s a host of letter combinations starting with E for European. 2 Accession Treaty 22Jan1972, European Communities Act. Demands for another referendum were deemed unconstitutional. Official join date was 01Jan1973 (19730101) along with Denmark and Eire. 3 Mrs Thatcher led the Conservatives 19750211-1990, PM from 19790504-901128 (between Callaghan and Major), brought down by the poll tax, but triggered by a challenge from Michael Heseltine. She died in 2013. See wikipedia. 4 from  As the UK's VAT base in comparison with gross national product (GNP) was proportionally higher than in other member states, and the UK was more open than other member states to trade with non-EC countries, this system implied a disproportionate contribution by the UK when it joined the EEC in 1973. Additionally, the fact that around 70 per cent of the EC budget was used to finance the Common Agricultural Policy (CAP), and that the UK had a small agricultural sector meant that the UK gained few receipts under the EEC's redistributive policies.To address this, at the Fontainebleau European Council in June 1984 Prime Minister Margaret Thatcher successfully negotiated the UK Rebate which was adopted in the May 1985 European Council decision. It has been in place ever since. Tony Blair agreed strongly with this when he was PM. 5 AV Plus candidates are ranked in order of preference. To ensure proportionality 15-20% of the whole is made up from party lists, so a second vote is required to elect these regional representatives. It is this second vote (made at the same time) that determines how many of these go to parliament. The advantages are explained in  and disagree with what I thought at the time, just pointing to the value of the internet. Those who prefer FPTP say it is too complicated (the electorate is stupid), it will lead to coalition government and two types of MP and it weakens the connection to ‘your’ MP. Those who prefer STV and PR say it is not proportional enough, too likely to lead to one-party government, two types of MP and won’t eliminate safe seats - and it is too complicated. See also STV and AMS and the simple AV. Do read  to see what is wrong with AV. En route, decide what it is that you would want from a system. I suggest that you’d like the national vote level to be reflected in the total vote — that, say, a 10% vote Green produces something like a 10% representation in the Commons. You might like or dislike party-nominated candidates, single-issue candidates and so on. You might research how these systems work. You might prefer positive campaigns rather than negative ones — have a look at Australian attitudes to the PR systems they use. 6 STV, single transferrable vote requires the voter to number their preferences. At the count stage all first preferences are counted; while there are more candidates than remaining seats, the bottom candidate in the count is eliminated and those votes distributed as per the next unused selection. This continues until the number of remaining candidates matches the number of available seats. The particular strength of this is that the elected representatives have been voted for, at some preference level, by a far greater proportion of the electorate than at present. That there are very few wasted votes. It allows for tactical voting in the sense, for example that a sure winner wouldn’t perhaps get your No1 vote. It works well against party-controlled lists, too. This system is used in Ireland and Malta for national level elections. See . STV is seen as the same as AV when there is only one seat at stake. For multiple seat elections it is the same as PR-STV, as preferred by the SNP (Scottish National Party). The significant advantage of this is that a genuine majority voted for the winner. Reminder from 2016 election; the Apathy party won 360/650 seats. 7  says she said a "splendid weapon for demagogues and dictators” and quotes source HC Hansard, 11 March 1975, col 307. So  is wrong, or she said something similar on another occasion. Or that quote is from Atlee. I note here, for those that like to ague with quiz answers, that the 1975 was not the first referendum of any description. 1973 contained a Northern Ireland referendum on becoming a United Ireland. Wikipedia points out that Churchill suggested one in 1945. I found a reference to several Welsh referendums on Sunday pub hours as early as 1961. So the first referendum in the UK, not UK-wide, was 8th November 1961: 47% turnout, 844834 votes cast on the topic of Sunday opening hours for pubs. This was the first of a cycle repeated every seven years, thanks to the Licensing Act of 1961. The requirement to hold these was repealed in 2003. One could argue that this was a national (Welsh) referendum. When, if ever, is a referendum result legally binding? How can we check that? Where was the evidence that advisory became decisive? The government believes it is in the best interests of the UK to remain in the EU. This is the way to protect jobs, provide security, and strengthen the UK’s economy for every family in this country – a clear path into the future, in contrast to the uncertainty of leaving. That is NOT what the Act says. I wonder who slipped that line in? And whether it was a known change? Actually, I've read the Act: What it says is that there shall be a result. It doesn't say anything about what happens to that result. A UK referendum only has the force of law if the Act setting it up says so. I quote from section 8 of the 2011 Act, which you can see for yourself here: The Minister must make an order bringing into force ...“the alternative vote provisions”) if more votes are cast in the referendum in favour of the answer “Yes” than in favour of the answer “No”.... So that is what a binding referendum looks like, and the 2015 one was not such. This Bill requires a referendum to be held on the question of the UK’s continued membership of the European Union (EU) before the end of 2017. It does not contain any requirement for the UK Government to implement the results of the referendum, nor set a time limit by which a vote to leave the EU should be implemented. Instead, this is a type of referendum known as pre-legislative or consultative, which enables the electorate to voice an opinion which then influences the Government in its policy decisions. The referendums held in Scotland, Wales and Northern Ireland in 1997 and 1998 are examples of this type, where opinion was tested before legislation was introduced. The UK does not have constitutional provisions which would require the results of a referendum to be implemented, unlike, for example, the Republic of Ireland, where the circumstances in which a binding referendum should be held are set out in its constitution. In contrast, the legislation which provided for the referendum held on AV in May 2011 would have implemented the new system of voting without further legislation, provided that the boundary changes also provided for in the Parliamentary Voting System and Constituency Act 2011 were also implemented. In the event, there was a substantial majority against any change. The 1975 referendum was held after the re-negotiated terms of the UK’s EC membership had been agreed by all EC Member States and the terms set out in a command paper and agreed by both Houses.